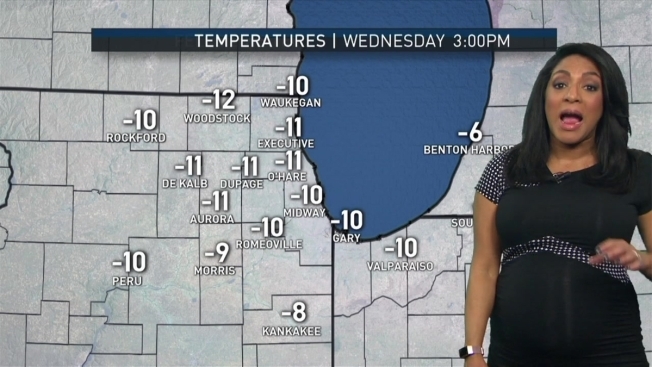 Alicia Roman is tracking a powerfully cold punch hitting the Chicago area. With wind chill values reaching as low as -60 degrees and temperature highs staying well-below zero, the Chicago area is set to see one of its coldest days on record this week. The forecast high temperature for Wednesday in Chicago is -15 degrees. If that forecast holds true, it will mark the coldest high temperature the city has seen since Jan. 20, 1994, when temperature highs were at -11 degrees. The coldest temperature the city has ever seen was -27 degrees, which happened on Jan. 20, 1985. The forecast low for Wednesday is 22 below-zero. The coldest high temperature for Jan. 30 in Chicago history is three degrees above zero, so the area could smash several cold-related records in the coming days. Pete Sack breaks down how quickly frostbite can occur in the dangerous cold set to hit the Chicago area. A Wind Chill Warning takes effect for the entire metro area beginning Tuesday evening and continuing through Thursday morning. A Wind Chill Advisory is in effect beginning at 4 a.m. Tuesday and continuing through 6 p.m.
A Wind Chill Warning means "the combination of very cold air and the wind will create dangerously low wind chill values," according to the National Weather Service. Current forecasts predict wind chill values during the polar blast to dip between -40 and -60 degrees.